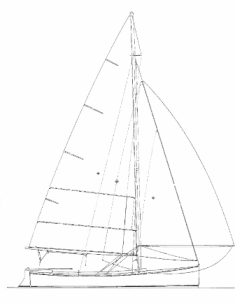 1938 Hull Yacht Club One Design, "Sea Bird"
Hull, Massachusetts can lay claim to some of the most storied maritime history in the nation. Both its setting and spirit have fostered great sailing success and yarns. Today that spirit is alive and growing; it is time to both document and celebrates Hull’s profound nautical history and outline a path to an even brighter future. "Return of the Sea Bird"
•The restoration of the only known remaining, 1938, Hull Yacht Club “One Design” sailboat, The "Sea Bird,"
•The history of Hull’s yachting and maritime history focused on one-design racing and The Hull Yacht Club. •	The Hull sailors who have and continue to triumph in varied sailing competitions. The residents of Hull have changed over the years; many are unaware of the rich maritime history that is the town's soul. This project will be a community effort; new bridges will be built and existing relationships solidified. Individuals interested in Hull’s maritime history and/or wooden yacht restoration will be given the opportunity to participate via the several organizations that will physically restore the "Sea Bird," research the relevant histories, produce the documentary, and continue to support sailing and maritime heritage in Hull. "This program is supported in part by a grant from the Hull Cultural Council, a local agency which is supported by the Massachusetts Cultural Council, a state agency."